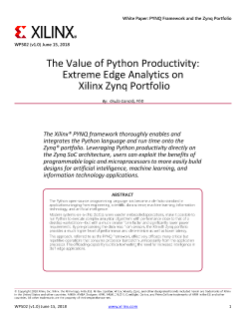 For designers looking to create a flexible platform that can scale across multiple price points, even different materials and processes but with the same embedded and application architecture, Xilinx is the leader in scalable Industrial IoT platforms by offering heterogeneous embedded processing, I/O flexibility, hardware-based deterministic control, and comprehensive solutions for the lowest total cost of ownership. 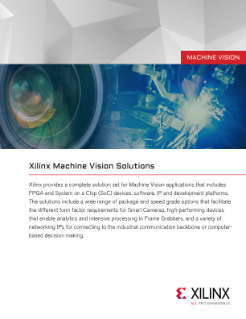 For designers looking to improve both speed and quality of the process, Xilinx offers precise, deterministic control over a scalable number of axes of motion via fast parallel processing of control loops (e.g. stepper, brushless, extruder). For designers looking to improve deterministic communications across internal subsystems, Xilinx’s comprehensive industrial connectivity portfolio supports diverse traditional Industrial communications, such as multiple iterations of CAN, and Industrial Ethernet standards), including support for Time-Sensitive Networking (TSN), along with common hi-speed communications like USB, PCIe, and others. For end users that require secure communications of intellectual property sent to a printer, Xilinx offers IEC 62443 cybersecurity built on a hardware root of trust with hardware and software cryptographic accelerators. Some Industrial IoT products need all elements of the Xilinx IIoT Solutions Stack, all need some. 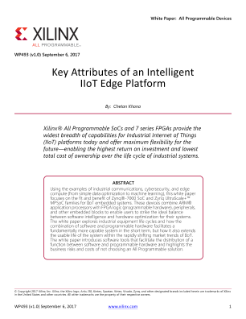 The Xilinx IIoT Solutions Stack is comprised of optimized Xilinx and Ecosystem building blocks and solutions used across Industrial and Healthcare IoT platforms. Starting from scratch is never something you will have to do with a Xilinx-based Industrial IoT system. Minimize development time and cost and maximize design reuse on your next Industrial IoT platform by exploring the different elements of the Xilinx IIoT Solutions stack.